Do you have a job? That's the question a young adult, fresh out of school, will most frequently be asked. Years ago, the question might have been different, focusing more on where will they be working rather than if they will be working? Surprisingly, this question is the same one asked to students/families regardless of what college they attended. $300,000 for college; More pressure to be "Perfect"
The reason there is so much pressure on students for their future has a lot to do with the fiscal investment. In a recent article $300,000 For College? Where’s That in the Bible?, describes the difficult choice that many families are making: choosing between retirement savings and their children's education. It points out that with the high cost of college it is nearly impossible for a high school student to save for all their college costs as was done decades ago. With parents trying to get the best return for their investment, the emphasis is on striving for perfection in every aspect of their college prep. Parents and students really want the same thing. But, it's hard to be perfect, all the time. So, student’s put pressure on themselves and parents reinforce the need to succeed, adding even more pressure. It reminds me of the old pressure cooker that my mom had, with a small valve to let some of the steam release out. But, what if there is no release valve? Everyone makes mistakes, but sometimes students believe that they are the only ones who fail. That leads to pressure-packed schools with high stakes, both monetary and emotional. Fortunately, many schools have instituted programs to deal with stress reduction. “Learning to Fail” addresses the growing trend of coping programs that deal with student stress, depression and anxiety. What can students do to succeed but do it in a healthy manner? It comes down to the old adage, Work Hard and Play Hard. As a parent in an affluent community, I would venture to say that most understand the work hard portion of this balanced ideal. Often, though, the Play hard aspect of the statement gets lost. Playing hard in high school means participating in extracurriculars like theatre, athletics, music, robotics, etc. The key to playing hard well means doing something because they love it, not because they think it will “look good” to colleges. A recent study , “Legacy, Leisure and the ‘Work Hard – Play Hard’ Hypothesis” , showed the benefit of working and playing hard. But how about taking the adage a step further. Why not: Work Hard, Play Hard and Discover Hard. Colleges seek out the curious--those who will blaze new paths, make a difference and discover new things. Discovery is important. By seeking new outlets, students can learn a lot about their passions. Often, they will try new things and fail. But that's OK, too. Failure is a great way for students to learn resilience. To know what you love and excel at, you have to also know your weaknesses. 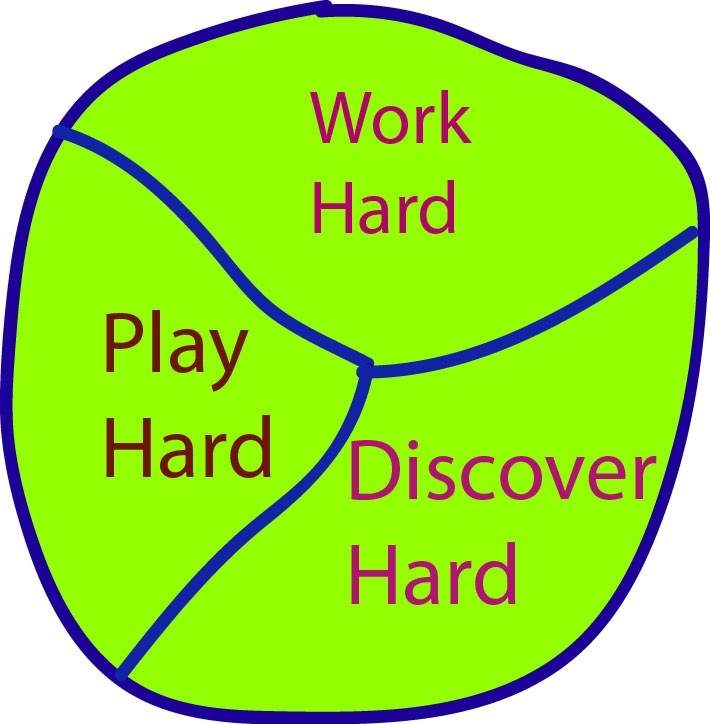 Work Hard, Play Hard, and Discover Hard is a good ethic to teach and nurture in our children and one that will resonate with colleges.